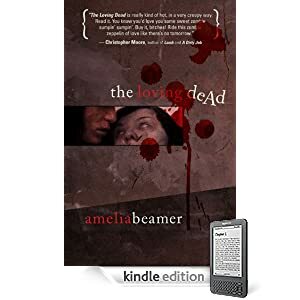 If Chuck Palahniuk and Christopher Moore had a zombie love child, it would look like THE LOVING DEAD, a darkly comic debut novel by Amelia Beamer. Kate and Michael, twenty-something housemates working at the same Trader Joe's supermarket, are thoroughly screwed when people start turning into zombies at their house party in the Oakland hills. The zombie plague is a sexually transmitted disease, turning its victims into shambling, horny, voracious killers after an incubation period where they become increasingly promiscuous. Thrust into extremes by the unfolding tragedy, Kate and Michael are forced to confront the decisions they've made, and their fears of commitment, while trying to stay alive. Kate tries to escape on a Zeppelin ride with her secret sugar daddy -- but people keep turning into zombies, forcing her to fight for her life, never mind the avalanche of trouble that develops from a few too many innocent lies. Michael convinces Kate to meet him in the one place in the Bay Area that's likely to be safe and secure from the zombie hordes: Alcatraz. But can they stay human long enough? Or purchase The Imago Sequence and Other Stories as a DRM-free e-book in the format of your choice through WebScription.net.